Many people think that the aurora borealis can only be seen from the northern hemisphere and that is false. The aurora can be seen both in the northern hemisphere and in the southern hemisphere in areas where, the field lines, point towards the earth, the poles. 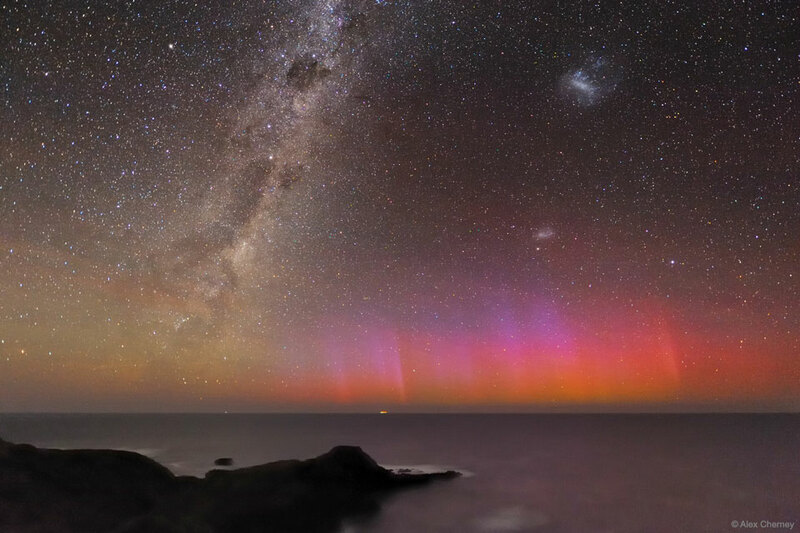 What you see is a beautiful image where not only the aurora is appreciated in Australia but also two of the things that I have always looked for in my travels to the other hemisphere (I live in the northern hemisphere today), the large and the small Magellanic cloud. Both are visible to the naked eye (no telescopes or similar) by the human eye on nights with no clouds. Obviously you will not see them as accurately as in the picture, but if they are a spectacle you should not miss it. And because the image is red?. The aurora is red because, as you will know and I have repeated hundreds of times, the energetically charged particles that cross the atmosphere from the Sun by the terrestrial magnetosphere exchange their energy and ionize the different parts of the atmosphere. The red color is because the oxygen atoms are excited by the energy and simply, the wavelength they emit is in the reds. Because you already know that an atom absorbs some energy by making its electrons rise energy level and the rest radiate depending on the layers in which the electrons are located. If this interests you, you can see and play with a more detailed explanation here.